NOTE: The following lengthy article was first published in the March/April 2004 issue of VegNews. When it was written, the McDonald’s lawsuit decision that the article describes was still being appealed. In 2005, after the appeals process concluded, I made some minor revisions and additions to this online version. I also appended a timeline of events and the list of groups slated to receive money allocated to “vegetarian groups,” both of which were included as sidebars within the original article. Finally, I have appended a short article, “McDonald’s Lawsuit is Over,” published in a subsequent issue of VegNews. The McDonald’s “french fry” lawsuit has become one of the biggest stories in the vegetarian movement, yet very little about it has appeared in vegetarian publications. The class action suit originated after it was discovered that the fast-food chain had not told vegetarians that its french fries and hash browns had beef in them, contrary to the impression some had after a company press release of July 23, 1990, which stated that McDonald’s fries were cooked in 100 percent vegetable oil. But alas, many unfortunate vegetarians did consume McDonald’s french fries or hash browns after July 23, 1990, and in doing so unwittingly consumed minuscule amounts of beef. A lawsuit was filed against the company and a $10 million settlement was agreed upon, with $6 million going to vegetarian groups. But then disputes erupted, not only with McDonald’s, but within the vegetarian community as well, over which groups should get the money—probably the most serious and most public division in the history of the modern vegetarian movement. The divisions resulted in accusations against some vegetarian groups of “sleeping with the enemy” and unethical conduct. The case is being appealed, millions of dollars are at stake, and the outcome is in doubt. What’s the story? 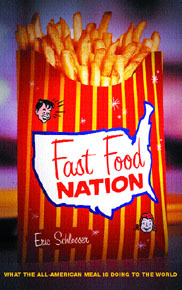 The controversy began with Eric Schlosser’s book Fast Food Nation, published in 2001. Schlosser, not himself vegetarian, noted the source of some of the so-called “natural flavors” in much fast food, remarking that the “natural flavor” in McDonald’s french fries was derived from beef. Ironically, in light of subsequent developments, Schlosser got his information from Vegetarian Journal, a publication of the Vegetarian Resource Group (VRG). One of Schlosser’s readers was a Jain who asked McDonald’s whether the company’s fries contained beef. McDonald’s confirmed Schlosser’s information by email, and on April 6, 2001 the information was published in India-West, a California-based weekly targeting Asian Indians in North America. Harish Bharti—a Seattle lawyer and a native of India—then filed a lawsuit on May 1, 2001 in King County, Washington, claiming that McDonald’s hadn’t told the truth about their ingredients; he cited this email and Schlosser’s book as evidence. McDonald’s quickly issued a denial, saying it had never claimed its fries were vegetarian and that they had always contained beef flavoring. But this denial provoked another unexpected development. Hindu nationalists in India, upon hearing about McDonald’s statement, were furious, and protests were launched at various McDonald’s restaurants. At some sites, the protests were peaceful; at others, they turned ugly, with windows broken and a statue of Ronald McDonald smeared with cow dung. McDonald’s backtracked, explaining that french fries sent to India (unlike its North American fries) were free of beef products. When laboratory tests revealed that no animal fat was in the french fries, the issue receded in India. But in the United States, additional lawsuits were filed in Texas, New Jersey, California, and Illinois, where the lawsuit was finally negotiated. McDonald’s denies lying about its french fries. The list of ingredients provided for their fries (before the lawsuit) included “natural flavor.” As many veteran ingredient-readers could quickly tell you, “natural flavor” can legally include animal products, including beef—as it actually did in this case. But more than that, some McDonald’s employees said that the fries were vegetarian. The most incriminating evidence was a 1993 letter written by a company employee stating that there were a number of items which “vegetarians can enjoy at McDonald’s” — specifically mentioning the french fries and the hash browns. On the other hand, the plaintiffs had one practical advantage: the area of public relations. McDonald’s had already received stunningly bad publicity in this case. They may have calculated that they could ill afford another “victory” like the infamous “McLibel” lawsuit in England. In that case, while McDonald’s successfully sued two anti-McDonald’s campaigners for libel, the case boomeranged into a constant stream of negative publicity about the corporation. No sooner had the proposed settlement been announced than questions began to be raised about who would receive the money. At a preliminary hearing in May 2002, Greg Khazarian represented Muslims who objected to the settlement. Khazarian stated to me that “the fatal flaw in the structure of the settlement is that Muslims are included in the class, but excluded as one of the groups receiving benefits in the settlement.” Several hundred Muslims filed objections. Muslims usually eat meat, but the meat must be slaughtered in accordance with “halal,” a procedure roughly similar to kosher. Clearly the McDonald’s beef was not “halal” (or kosher, either). There are roughly 7 million Muslims in the United States, compared to about 6 million adult vegetarians. While vegetarian groups were slated to get 60 percent of the settlement, there was no category for Muslim groups. At the preliminary hearing on May 1, 2002, the judge said that the Muslims “could be accommodated within the parameters of the proposed settlement,” according to Khazarian. In the final settlement approved by the judge, Muslims were included in the vegetarian category. When the proposed list of recipients was released in September 2002, there were further objections, but from vegetarians rather than Muslims. The proposed money for “vegetarian groups” was to be divided not only among traditional vegetarian groups, but Muslim groups and organizations which might carry an anti-vegetarian agenda. Eight months later, on May 19, 2003, a revised list was approved by the judge over the objections of many vegetarians (see below: “Groups Proposed To Receive Money for ‘Vegetarian Groups'”). This list was surprising to many vegetarians. Many well-known organizations such as People for the Ethical Treatment of Animals (PETA), Farm Animal Reform Movement (FARM), Physicians’ Committee for Responsible Medicine (PCRM), and EarthSave were missing. Why were these and many other groups omitted? We don’t know what went on in the attorney’s negotiations, but by the terms of the agreement, McDonald’s had to have a hand in the allocation process. So McDonald’s attorneys may have vetoed some groups. Moreover, animal rights organizations were also specifically excluded by the court, as the treatment of animals was never an issue in the lawsuit—only the treatment of the humans who were deceived by McDonald’s publicity. What about the groups that are on the list? Two of them, the Islamic Food and Nutrition Council of America (IFANCA) and the Muslim Consumer Group for Food Products, don’t seem to fit any conceivable definition of a “vegetarian group”; they are concerned with “halal” or the foods (especially slaughtered animals) which Muslims are allowed to eat. Evidently they were included as a concession to Muslim objections. While all four of these research groups face some vegetarian opposition, three of them (VNDPG, PMRI, and Loma Linda) also appear to have strong support in the vegetarian community. VNDPG has done much valuable work promoting vegetarianism among nutrition professionals, and many regard it as a bona fide vegetarian group; some of the most pioneering research on vegetarianism has come out of Loma Linda University; and PMRI and Dean Ornish have done much research supporting the thesis that a strict vegetarian diet can actually help reverse heart disease. The proposed allocation of money has created passionate opposition among some vegetarians. Among these, none has been more passionate or as outspoken than Jeff Nelson, who heads VegSource Interactive and the website vegsource.com. — John McDougall objected only to Tufts. — Colin Campbell, a professor at Cornell, objected strongly to VNDPG and Tufts but suggested that $1 million should be given to Cornell University for their Program for Lifetime Nutrition. — Rhoda and Stan Sapon objected to VRG, but asked that $100,000 be given to the Maimonides Project (a vegetarian hunger relief group which they founded). Nelson’s tactics in opposing the settlement have provoked intense feelings. In December 2002, Nelson attacked the two most important vegetarian groups that were slated to receive settlement money, the Vegetarian Resource Group (VRG) and the North American Vegetarian Society (NAVS), in an explosive article titled “Sleeping with the Enemy.” VRG and NAVS are both older and well-established vegetarian organizations. These comments — prominently featured on the VegSource web site for many months — are unprecedented in the history of the western vegetarian movement. While there have been vehement disagreements before, they have usually remained at the level of private disagreements, and even when public have seldom, if ever, involved charges of immorality, deception, betrayal, and hypocrisy. The effects of these accusations have been very significant. Sharon Graff [of NAVS], in an email sent to FARM president Alex Hershaft in February 2003, stated that “NAVS and Brian [Graff, an NAVS director and vice president] have been under attack since early December  from Jeff’s declaration, articles and the spin-off reaction.” Graff cited numerous examples of angry emails that NAVS had received. What were Nelson’s accusations, and are they true? It is beyond the scope of this article to consider all the issues involved, but there are four broad claims made in Nelson’s rhetoric. 1. The refusal to support the lawsuit initially. What VRG does say—and Nelson actually cites this in his declaration to the court, apparently oblivious to the fact that it disproves his claim—is that “the approach of many people quickly attacking a company for what they’re not doing, rather than giving assistance and encouragement for what they are doing, can be counterproductive at times. Think through your strategies. Sometimes protest is called for, at other times encouragement” (emphasis in original). This reply implies only that lawsuits may be a bad tactic, and counsels caution. Moreover, this editorial was certainly not a comment on this particular lawsuit, since it went to press before the lawsuit was filed. The source of the statement that Brian Graff did not support the filing of the lawsuit is apparently an off-hand private conversation that Brian had with vegetarian activist Lige Weill in which Weill urged Graff to support the lawsuit financially. Even if true, this comment was not a public position, was not a position of NAVS, and only rejected financial support for the lawsuit, not the lawsuit itself. 2. VRG’s “cozy” relationship with McDonald’s. Vegetarian Journal did publish an article by Davida Gypsy Breier and Sarah Blum which lists “vegetarian” items in fast food restaurants and states “we’ve labeled items as vegetarian when there could be a few ‘maybe’ ingredients, such as mono- and diglycerides and/or natural flavors … everyone draws the line as to what he or she will eat in a different place.” Whether this article constitutes an official “stance” of VRG, or just the opinion of the authors, is not clear. The question of how strict vegetarian advocacy should be is often discussed in the movement, with some vegetarians using references to the “vegan police” to make a case for a more casual approach. 3. NAVS’ failure to report the lawsuit to other groups. Sharon Graff commented, “We were willing to place the [legal] notice [from the court] and apology [from McDonald’s] in Vegetarian Voice. However, it was never submitted to NAVS… We most certainly had not been provided information pertinent to others, so there was nothing for us to conceal.” The legal notice was eventually published in VegNews and Satya. The problem here is, what is the nature of “aiding and abetting” and what form did it take? What does “sleeping with the enemy” mean? Nelson does not make it clear, nor does he provide any particular evidence to support any interpretation of his conclusions. Nelson’s statement that McDonald’s proposed to “reward” NAVS with $1 million for its “unethical” complicity with McDonald’s certainly suggests the possibility, if not the probability, of a quid pro quo as part of an explicit deal. “Sleeping with the enemy” implies joint, coordinated activity of a secret, consensual, and traitorous sort—in short, it implies collusion. And though Nelson gives no evidence for this and never uses this word, above one of his stories attacking VRG and NAVS, there was a picture of a devil figure, smiling and burning money. 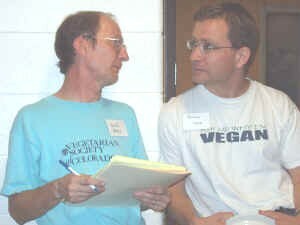 A number of prominent vegetarians declined to comment on Nelson’s tactics or any other aspect of the case, including the leaders of VRG and Jeff Nelson and many of his allies. Several prominent vegetarians, however, were willing to speak, and their comments were interesting and revealing. The judge approved the settlement on October 30, 2002, and the allocation of funds on May 19, 2003. Two appeals were filed shortly thereafter (one by Muslims, the other by vegetarians). In between these two events, the strategy of the vegetarians objecting to the allocation appears to have shifted in several ways. The first change is embodied in the vegetarian appellants’ brief filed by Michael Hyman and received by the court on December 11, 2003. In contrast to the wide diversity of views expressed by vegetarians submitting declarations to the court previously, it objects not only to the two Muslim groups receiving money, but to all of the “research” organizations—Tufts, Loma Linda, VNDPG, and PMRI. The brief also argues that the amount of money given to the vegetarian organizations such as VRG and NAVS is excessive as well. The second substantial change was the disappearance of Jeff Nelson as the key figure among the vegetarian objectors. When the vegetarian appeal was filed on June 16, 2003, Nelson was not one of the appellants. While Nelson clearly has close ties to several of the vegetarian appellants, not all of them share Nelson’s views about NAVS and VRG “sleeping with the enemy.” At least one of the appellants, Alex Hershaft, made behind-the-scenes attempts to effect a reconciliation between Nelson and NAVS and get NAVS to join the appeal, affirming that NAVS had indeed acted ethically. But no reconciliation occurred. The brief also argues against giving so much money to NAVS because it is “a pint-sized organization.” It also argues against giving so much money to VRG, repeating arguments used against VRG in Nelson’s “Sleeping with the Enemy.” The brief does not specify what the correct allocation should be, but asks that the allocation should be reversed and sent back to the circuit court for further action. The last chapter of the McDonald’s saga has yet to be written. Appeals are in process. Millions of dollars are at stake, which could conceivably benefit one or another of very different vegetarian groups, some of which seem to be at each others’ throats. July 23, 1990: McDonald’s announces that its french fries will be cooked in 100% vegetable oil. May 5, 1993: McDonald’s letter to a customer claims their french fries are vegetarian. 1995: Vegetarian in Boulder, Colorado successfully sues Pasta Jay’s for claiming a marinara sauce was vegetarian when in fact it contained anchovies. January 1998: Vegetarian Resource Group (VRG) publishes article by Jeanne-Marie Bartas, “Vegan Menu Items at Fast Food and Family-Style Restaurants — Part 2,” Vegetarian Journal, January/February 1998, documenting that McDonald’s french fries have an animal ingredient. January: Eric Schlosser publishes Fast Food Nation, quoting from VRG and making information about beef in the french fries more widespread. April 6: E-mail from McDonald’s confirming that french fries have beef in them is published by India-West. May 1: Harish Bharti files suit in King County, Washington, alleging McDonald’s was not telling the truth about its french fries and hash browns. May 4: Attacks on McDonald’s in India, including desecration of a statue of Ronald McDonald and breaking of windows. May 15: Laboratory tests confirm that french fries in India do not contain beef. May-June: Additional lawsuits against McDonald’s filed in California (May 10), Illinois (June 4), Texas (June 11), and New Jersey (June 27). March 8: published reports of an impending settlement in the lawsuit. May 1: Preliminary hearing on the lawsuit. Judge Siebel says that Muslims can be accommodated under the settlement. September 24: Attorneys file a proposed allocation of funds, including allocation of some “vegetarian” money to Muslim groups, Tufts University, and UNC Department of Nutrition. October 28, 29: Declarations attacking the settlement are filed by Colin Campbell, John McDougall, Rhoda Sapon, and Pat Fish. Many other declarations are also filed in the time period following. October 30: Judge approves the settlement (but does not rule on allocation of funds). December 11: VegSource web site publishes Jeff Nelson’s article, “Sleeping with the enemy,” accusing VRG and NAVS of “aiding and abetting” McDonald’s in this case. January 13 and 27: hearings on the proposed allocation of funds. March 25: Judge Siebel throws out UNC Department of Nutrition as one of recipients. May 19: Judge Siebel approves the revised allocation list. June 16: Michael Hyman, attorney, files an appeal of allocation list on behalf of “prominent” members of the vegetarian community. December 10: fundraising appeal from the National Health Association denounces allocation of settlement money for Tufts, ADAF, and the Muslim groups as an “outrage”; suggests “at least $1 million” should go to the National Health Association. December 11: appeals court receives the vegetarian appellants’ brief, which objects to all of the research organizations and to the “excessive” amounts of money allocated to the vegetarian groups. March: VegNews article “The McDonald’s Lawsuit: What’s the Story?” appears in the March/April issue of VegNews. March 31: Illinois Court of Appeals upholds the allocation of $10 million to the proposed recipients. Fourteen other groups received the remaining $4,000,000 allocated to Hindu and Sikh organizations, Kosher groups, and children’s groups. This list was approved by Judge Richard Siebel on May 19, 2003, but was appealed separately by both vegetarians and Muslims. On March 31, 2005, the Illinois Court of Appeals upheld the settlement; no further appeals are in process and the money is in the process of being distributed. The lawsuit against McDonald’s concerning beef in their french fries is over. On March 31, the Illinois Appellate Court upheld the distribution of $10 million in the case, including $6 million to “vegetarian organizations.” Vegetarian appellants had questioned whether some of the recipients (such as Tufts University) were really “vegetarian organizations.” But the appellate court upheld the settlement, saying that the intent of the settlement “was to use the funds for programs serving the interests of people following vegetarian dietary practices in the broadest sense.” No further appeals are in process. As of June 1, no actual money had been distributed yet. “We got a letter about mid-May,” said Freya Dinshah of the American Vegan Society. “They are researching whether we comply with the Patriot Act — to verify that we won’t divert funds to Al-Qaeda or something.” Groups are restricted in what they can do with the money — “this money must be spent specifically for those [court-approved] projects,” pointed out Brian Graff of the North American Vegetarian Society. This entry was posted in Politics, or the lack thereof, Vegetarianism / Veganism on November 16, 2005 by Keith Akers.